Today’s adventure comes just in time for the holiday season. 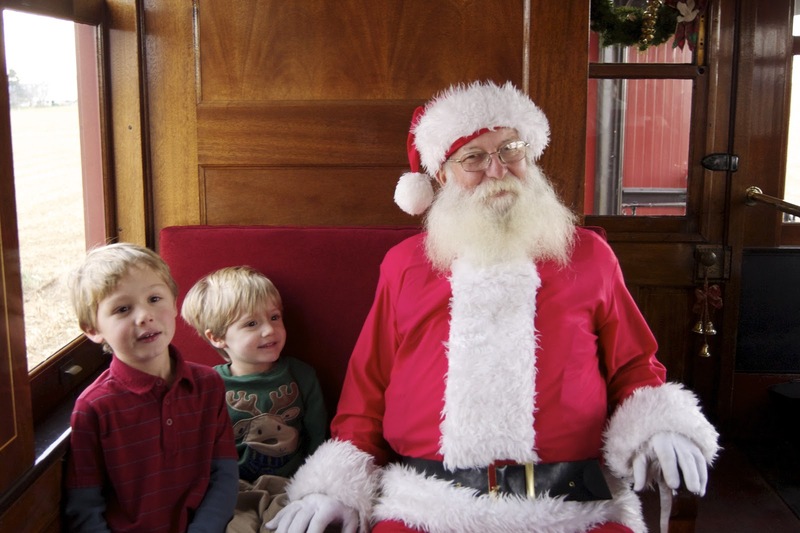 Santa’s Paradise Express, the Stasburg Rail Road and the ChooChoo Barn make the perfect holiday tradition. 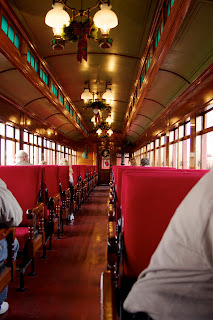 Climb aboard one of the magnificently restored cars and be transported back to a simpler world. Don’t worry about the cold, each car is heated by a coal stove, so they’re nice and toasty. As the monster steam engine pulls out of the station the fun begins. Incase the beautiful Lancaster County countryside wasn’t enough, carolers, horn players and Santa himself move throughout the cars for your enjoyment. Santa was the crowd favorite with our family. The boys lit up as soon as they saw him enter our car. Not only does the man in red stop to chat with each child and have his photo taken, he also gives every child a little treat. The boys got little lantern pencil sharpeners, that they thought were the coolest thing since sliced bread. Cameron even took his to school. The train ride is about 45 minutes long and it’s a blast from start to finish. 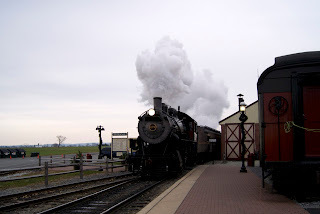 The Strasburg Rail Road also has a ton of fun to enjoy around the station. 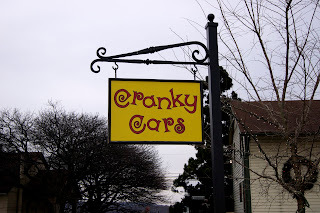 Your kids will love the Cranky Cars and the Cagney Train. Then warmup in the Tinsel Trolly and enjoy a few holiday stories in the Story Caboose. In addition to all the fun activities there are a few gift shops and the Trackside Cafe. When you’re finished at the rail road, chug on over to the ChooChoo Barn. I’ve seen a lot of train displays in my life but this one is by far the coolest. When you walk into the little gift shop you have no idea just what lies behind the curtain. It’s HUGE!!! 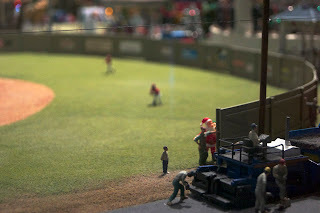 I could have spent hours upon hours gawking at the train display. At 1700 square feet, the ChooChoo Barn is as big as my first house and it’s chockfull of things to look at. 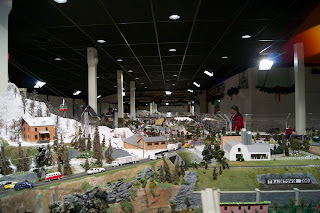 The train display, with 22 moving trains has actual animated people. I have NEVER seen that before at I have to say that seeing those little people hammer away on the roof of a barn was pretty neat. As you make your way through the display, don’t forget to keep an eye out for the 51 Santas, there’s even a Where’s Waldo Santa! The boys had a blast trying to find them all and got so excited with each new sighting. The lights dim from day to night and back again giving you a whole new perspective on the display. 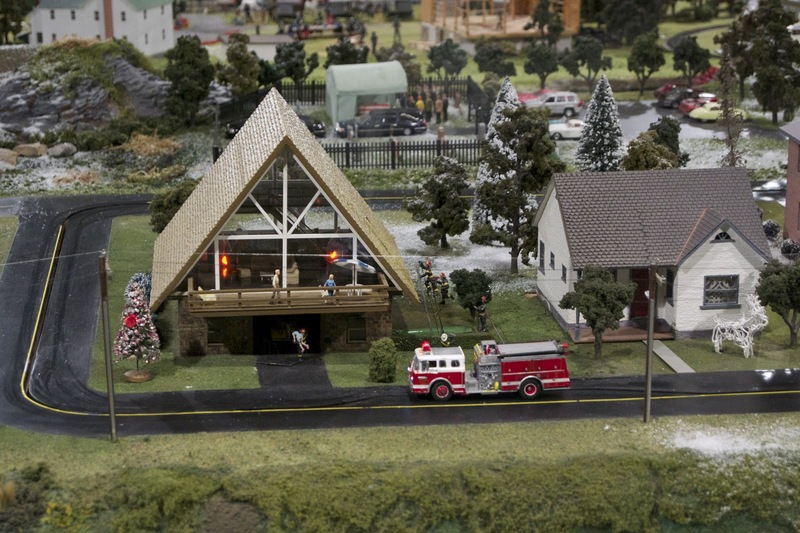 One of my favorite features was the house that caught fire. There’s actual smoke, firemen come to save the day and use real water to put out the (not so real) flames. 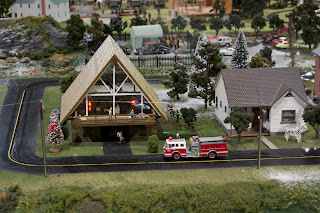 The level of detail inside the ChooChoo Barn is nothing short of spectacular. 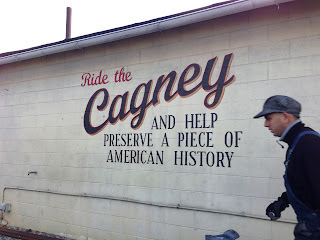 When we finished our tour of the Strasburg Rail Road and the ChooChoo Barn, we got some delicious snacks at Uncle Leroy’s (next door to the ChooChoo Barn) and headed home. The boys raved about their trip and want to go back again before the end of the season. The Strasburg Rail Road has become a beloved holiday tradition for our family and we would highly recommend that you make it a tradition for your family as well. This was such a fun adventure that I’m thrilled to be able to share the experience with one lucky Philly Burb Moms family. 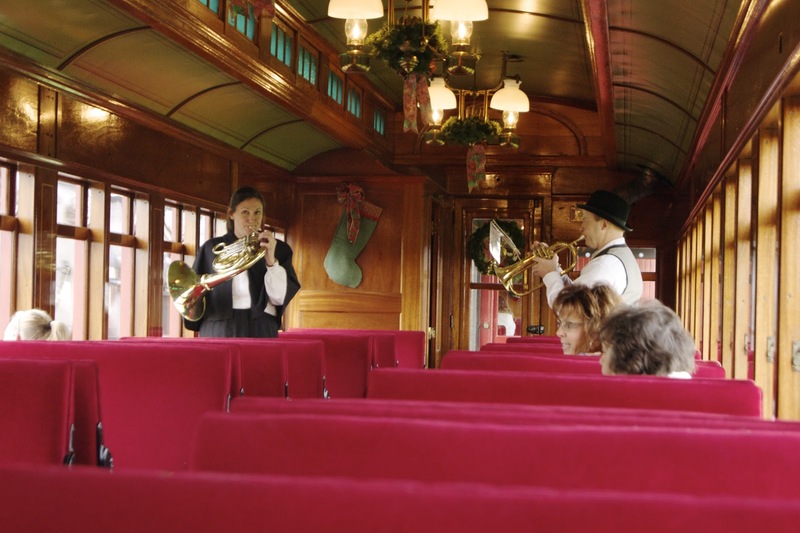 That’s right folks, one lucky winner will win a four pack of tickets to ride Santa’s Paradise Express on December 16th at 3pm AND four tickets to check out the ChooChoo Barn before December 31st.